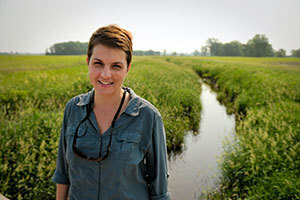 Jennifer Tank, Ludmilla F., Stephen J., and Robert T. Galla Professor of Biological Sciences at the University of Notre Dame and an international authority on the cycling of nutrients in freshwater ecosystems, has been named a 2013 Leopold Leadership Fellow. Based at the Stanford Woods Institute for the Environment, the Leopold Leadership Program provides outstanding academic environmental researchers with skills and approaches for communicating and working with partners in nongovernmental organizations, business, government and communities to integrate science into decision-making. The program is funded by the David and Lucile Packard Foundation and by the William and Flora Hewlett Foundation. Tank is one of 20 mid-career academic environmental researchers named as fellows this year. The group was selected through a highly competitive process on the basis of their exceptional scientific qualifications, demonstrated leadership ability and strong interest in sharing their knowledge beyond traditional academic audiences. Tank’s research focuses on the influence of human land use on stream ecosystem function. Human land use, such as agriculture fertilizer application, adds large amounts of anthropogenic nitrogen to terrestrial and aquatic ecosystems. Her goal is to better understand the role that small streams play in removing nitrogen from the water and to prevent it from polluting downstream ecosystems. She also is affiliated with Notre Dame’s Environmental Change Initiative, which conducts policy-oriented research in the areas of climate change, land use and invasive species to help decision-makers manage critical environmental challenges. As a 2013 Leopold Leadership Fellow, Tank will take part in intensive leadership and communications training designed to hone her skills in engaging with decision-makers, media and the public. The fellowship also offers peer networking and mentoring through the Leopold Leadership Network of advisers, trainers and past fellows. Previous Notre Dame Leopold Leadership Fellows include biologists David Lodge and Jessica Hellmann.